09 Jan 2018 --- The use of camelina oil reduces overall and LDL cholesterol levels in people with impaired glucose metabolism, according to a new study from the University of Eastern Finland. The study, published in Molecular Nutrition & Food Research, analyzed the associations of camelina oil, fatty fish and lean fish with lipid and glucose metabolism, and low-grade inflammation. Camelina oil is rich in alpha-linolenic acid, which is a plant-based omega 3 fatty acid. Earlier research has shown that fish protein and long-chain omega 3 fatty acids found in fish have beneficial effects on several risk factors associated with cardiovascular diseases. Click to EnlargeResearch evidence relating to the effects of alpha-linolenic acid on these risk factors, however, remains scarce. The study involved 79 Finnish men and women with impaired fasting glucose concentrations aged between 40 and 72. The participants were randomly divided into four groups: the camelina oil group, the fatty fish group, the lean fish group, and the control group. Depending on their group, they were instructed to eat either fatty or lean fish four times a week, or to take a daily 30 ml dose of camelina oil for a period of 12 weeks. People in the control group were allowed to eat fish once a week, and the use of camelina oil or other oils containing alpha-linolenic acid was prohibited. The researchers found that camelina oil had a positive effect on blood cholesterol levels, but no similar effects were observed for fatty or lean fish. Moreover, there were no significant differences in glucose metabolism or low-grade inflammation between the groups. According to Innova Market Insights data, product launches tracked featuring camelina oil (global) have seen a CAGR of 29 percent between 2012 and 2017. Thirty-nine percent of the global food and beverage launches tracked with camelina oil fall in the Supplements product category. 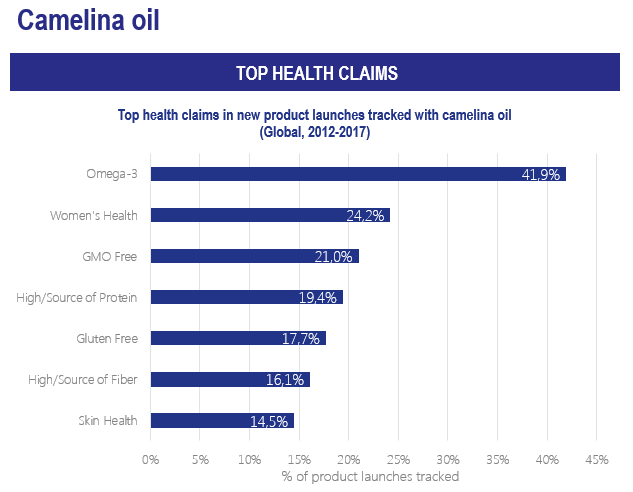 The top three claims in launches with camelina oil (Global, 2012-2017) are Omega 3, Women’s health and GMO-free, respectively. It is important to note that the number of launches with camelina oil is still limited, however. The addition of camelina oil as a supplement is still in its infancy, although further research into its benefits is likely to support its growing prevalence in NPD.